It was an epic encounter yesterday at Bellerive Country Club, St. Louis for the 2018 PGA Championship. Not between Brooks Keopka and Tiger Woods or Adam Scott or Justin Thomas, but between Tiger and himself. 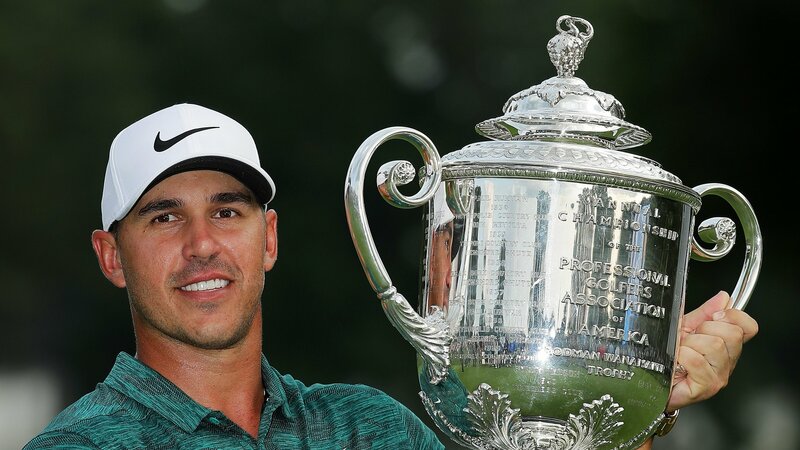 When it was all said and done, Brooks Koepka came out as the man on top, making it two from four Majors in the 2018 season. He moves to No. 4 in the Official World Golf Rankings. It was fascinating to watch; the sweat, facial expressions, twitches, little shows of irritation, intense anger, joy and finally the ecstasy of winning against the doubt demon’s that have lived within him for over a decade. That trademark fist-punch on the 72nd hole from an exhausted and aging looking Tiger was not because he knew he had any chance of winning the PGA Championship, but that he had finally conquered the question to himself, can I do this? The sight of Tiger punching the air on the 72nd hole sent golf fans into a frenzy. He did it in a heroic fashion hitting fewer fairways than any of the other top players and yet shooting the lowest final round he has ever shot in a Major. The burning passionate, obsessive ‘desire’ kept driving him. He knew this was it. He had achieved his goal in Carnoustie by hitting the top of the leader-board on the back nine on Sunday but was unable to close. Something he always did when he dominated. He looked a little lost at Carnoustie when it did happen and seemed unsure as to what to do. It was almost like his tank was empty after he had achieved that set goal of getting into contention. At Bellerive on Sunday, it was an exhausting roller coaster ride all the way from the missed easy birdie on the first, to his exuberant birdie on the final hole. You could see the inner struggle going on the whole way through the round. Scolding himself, talking to himself, trying to remember what he did with unconscious ease in the past to win in these situations. He looked exhausted towards the end. He knew he was not going to win after 17. The Koepka’s, Johnson’s or Thomas’s no longer fear seeing his name on the leaderboard. They know they can beat him now and they did in Carnoustie and in St. Louis. Koepka was a truly worthy winner yesterday. What they may not realise because they were busy battling to win, was that yesterday was a game changer for Tiger. He now knows deep down in his own heart that he can win a Major again. He proved it to himself. There's nothing quite like a Tiger fist pump. It was one of the bravest rounds of golf I have seen and reminded me of the heroic day that Seve played Tom Lehman in the first match on the final day of the Ryder Cup in 1995. It took guts, desire, passion, nerves and control of the many emotions going on in that complicated mind of his to do what he did. Tiger is now well and truly back. Back and at peace with himself. He now knows he can do it and it will only be a matter of time.